Speaking of Christmas, this year Brady decided to make his own Christmas cards for his teachers. That boy is SO sweet! 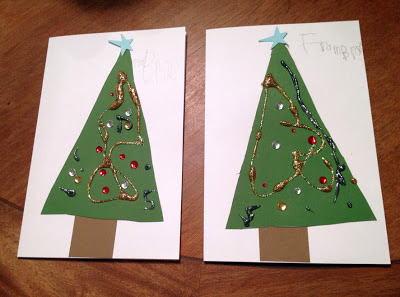 He told me he wanted a Christmas tree on the card so Dustin and I drew some triangles for him to cut out himself. I trimmed the tree trunks and punched the stars our for him but he picked the colors. He added the rhinestones and Stickles himself. He wrote From Brady on the front of both as well. Then he wrote a special message inside for his teachers. He really is a sweet little doll. I didn't do anything crafty for their presents this year. They will get these cards with some gifts basket things from Starbucks.